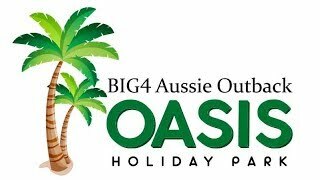 Now dog and pet friendly, Big4 Aussie Outback Oasis is a popular accommodation choice for visitors or workers to the Charters Towers region. The property is set on 10 acres of parkland and is a birdwatchers paradise. Opened in early 2000, the park has been immaculately maintained over the past 15 years. They have 20 Cabins with five styles to choose from. From their Family Chalets or Studio Villas to their Workers Cabins, they provide the very best in quality and cleanliness for their guests. The Villas are self-contained and well equipped for longer stays with modern furnishings. Free wi-fi is available to all guests. Foxtel is connected to all rooms. Guests can also take advantage of the 21 metre resort style pool and saltwater rock pool or just relax on their deck overlooking the beautiful gardens. Caravan sites are a combination of large slab or grass sites with many being drive-through. They cater for all types of rigs - small, big and enormous. You'll love using their spotlessly clean amenities and laundry. In the winter months, the Park plays host to guest entertainers, Meet and Greet afternoons by the camp fire and themed Meal Nights. Recently refurbished modern studio cabins overlooking beautiful parklands. Six cabins in total and each have a Double bed. An extra single bed or fold-out sofa lounge is available in all cabins. Perfect for overnight or longer. Beds in the living area, ensuite bathroom, kitchen,Foxtel. Linen included and all beds made. This luxurious accommodation has quality amenities and furnishings. There are two bedrooms separate from living area. The main bedroom has a queen size bed and the second room sleeps two to four people. There is a sofa lounge in living area, and a full bathroom with separate toilet. Perfect for business or leisure. Foxtel and Wi-Fi included. Deluxe Chalet has a queen bed in the master bedroom, double bunks opposite the bathroom plus a sofa lounge. It has modern and fresh decor, quality furnishings, a large parking space beside the villa and Foxtel television. Linen is included and the beds are made. The chalet overlooks parkland. Recently refurbished open plan villas with quality furnishings. Consists of a queen bed and single beds in the living area, ensuite bathroom, full kitchen, Foxtel, linen included with all beds made. These villas are closest to the pool. Great for families. One of these Villa's has Wheelchair accessible bathroom and ramps to the Villa.